Clarified butter, also called Ghee in Indian cuisine, is simply butter with the milk proteins, sugars and water removed. It’s perfect for people who want to stay 100% Paleo or who might worry that some constituents like lactose or casein in the butter might cause health problems. I personally prefer consuming clarified butter because I’ve been dealing with leaky gut and autoimmune problems for a number of years and I now always stay on the safe side, even though butter is already pretty safe by itself. The other advantage of clarified butter is that you can heat it at a much higher temperature because it’s a highly saturated fat and you don’t run the chance of burning any of the milk solids. It’s ideal for sauteing, roasting, stir-frying or any other cooking method that requires high-heat. It has a delicious nutty taste that will please any butter lover out there and goes well with virtually anything. I honestly haven’t found a single preparation where clarified butter is not well-suited. You can of course buy butter already clarified at your local Indian food store or online from sites like Pure Indian Foods, but it’s also very easy to make at home. It’s very important that you choose a high-quality, unsalted butter coming from pasture-raised and grass-fed cows. 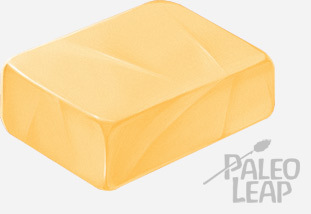 The quality, color and nutrition value of the butter will be much greater in such butter. When the cows eat a rapidly growing green grass, the butter will often have orange undertones, reflecting the high amount of carotenes in it. Kerry Gold sells a very high quality pastured, grass-fed and organic butter all over the US. There are basically two methods used to make clarified butter, the slow melting method and the shorter boiling method. Both produce similar results. 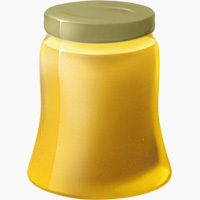 A glass jar for finished clarified butter. Place the butter in a pot or Dutch oven and slowly melt it at a low temperature. Don’t stir during the melting process and don’t worry about the milk solids burning since that temperature is quite low. When all melted, use a spoon or slotted spoon to remove the froth that formed on top. Line a fine mesh strainer with layers of cheese cloth or place a paper towel over a jar or bowl and pour in the melted butter. Once poured, let stand for a couple of minutes so the water and fat separate and then spoon off the butter in your final glass jar being careful not to put any of the water that is now in the bottom of the bowl. Melt the butter over a medium-high heat while stirring occasionally to make sure the milk solids don’t burn. Remove the froth on top during the process with a spoon or slotted spoon. The butter will come to a boil and you can now let it boil for about 15 minutes while stirring from time to time. When the water has all evaporated, the butter will stop boiling and this is when that clarified butter is ready. Line a fine mesh strainer with a cheese cloth or paper towel over your final glass jar and pour the clarified butter. In the process of clarifying butter, you can add all sorts of herbs and spices to infuse their aroma and color and give the resulting ghee a delicious taste that will give the food you prepare an even more delicious taste. When making flavored ghee, it’s better to clarify the butter with the boiling method so the herbs or spices have a chance to infuse all their taste. Add your favorite combination of herbs and spices right about when the butter is melted and leave them until the very end of the process. Garlic ghee: 6-7 crushed or minced garlic cloves. Cardamom ghee: 6-7 crushed cardamom pods. Mint-Jalapeño ghee: 1/2 cup mint leaves and 1 large, chopped jalapeño. Rosemary-thyme ghee: 6 sprigs each of rosemary and thyme. Ginger ghee: 2 tbsp fresh minced ginger.